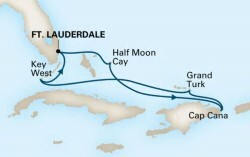 Please call Bluegreen Travel Services at 800.459.1597 to learn about similar Holland America cruises. Do you enjoy gourmet food or an expertly crafted cocktail? Holland America Line is offering special theme cruises just for you! Food & Beverage Aficionado Cruises feature one of Holland America’s highly regarded Culinary Council chefs or its Master Mixologist. The Culinary Council is comprised of elite international celebrity chefs who bring global influence to every dining venue on Holland America’s ships. The Master Mixologist develops an innovative menu of cocktails for the fleet. Guests on these sailings enjoy demonstrations, talks and book signings, and have opportunities to meet the pros and take photos with them. Join them, if you like, at an intimate, reservations-only dinner at the Pinnacle Grill. All of these activities—except the dinner—are complimentary. Availability for the hosted dinners is limited; after you book your cruise, be sure to reserve your place at the table. Book Your 2018 Food & Beverage Afficionado Cruise With Bluegreen Travel Services Now! Host — Chef Ethan Stowell: His highly acclaimed restaurants have helped to change the face of the Seattle food scene. He was named one of the “Best New Chefs in America” by Food & Wine magazine in 2008. Host — Master Mixologist Dale DeGroff: Known as “King Cocktail,” DeGroff is a 2015 James Beard Who’s Who inductee and brings his innovative cocktails to Holland America’s fleet, including the perfect Whiskey Smash. Call 855.645.2215 to Book Your Holland America Cruise Today! *BLUEGREEN TRAVEL SERVICES AMENITY DEPARTURE ONBOARD CREDIT OFFER TERMS & CONDITIONS: $25 onboard credit per stateroom booked through Bluegreen Travel Services. Onboard credit may be used for select purchases aboard the cruise ship and has no cash value. New bookings only. Subject to availability. Terms and conditions apply. Fares above are shown in $USD. The company reserves the right to re-instate the fuel supplement for all guests at up to $USD9 per person per day if the NYMEX oil price exceeds $USD70 per barrel. 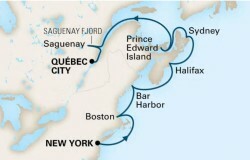 Prices are per person, for cruise only, based on double occupancy. 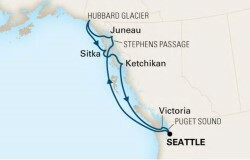 Price reflects best fare available for each stateroom on one date that this itinerary is available. Changing the dates may change prices. Prices do not include Government Fees & Taxes. Pricing and availability subject to change without notice. See important Terms and Conditions of the contract. Price is per-person based on double occupancy, cruise only for select sailing date and stateroom category, and includes port charges. Government taxes and fees are additional. Prices, additional fees, itineraries, and availability are subject to change without notice. Fares shown are in U.S. dollars for new reservations only and are subject to availability. Deposit of $250 due at time of booking. Please call us at 800.459.1597 for more information. Onboard service charges are additional, may be automatically added to your onboard account, and are subject to your discretion. Certain terms, conditions and restrictions may apply. This offer may not be combined with any other offer/promotion and may be withdrawn at any time. Not included: air transportation, airport transfers, car rental, items of a personal nature, restaurant fees, some beverages, and photographs. Great Vacation Destinations, Inc., doing business as Bluegreen Travel Services, is located at 12400 S. International Drive, Orlando, FL 32821.Great Vacation Destinations, Inc. is registered with the State of California as a Seller of travel Reg. No. 2068362-50 (registration as a seller of travel does not constitute approval by the State of California); Washington Seller of travel Reg. No. 602-283-711; and registered with the Airlines Reporting Corporation (“ARC”) number 15-72225-4. In the event of a conflict between the Holland America Line’s Details of Participation and Great Vacation Destinations’ Details of Participation, Holland America Line’s Details of Participation shall govern.